Tyrone (from the Irish, Tír Eoghain) is the largest county in Northern Ireland. Broad stretches of forestry make for a rather companionable contrast between that of its neighbouring county, Fermanagh, which is equally as proud for its bounty of lakes. The Sperrin Mountains to the west, which fall within both Tyrone and Londonderry counties, make up some of the largest upland areas in Ireland. 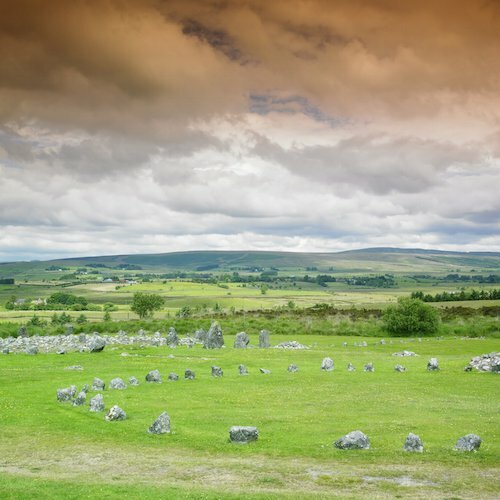 Towards Cookstown, the ancient stone circles at Beaghmore likely mark a religious, ritual gathering place, or the crude makings of the science of astronomy. South of Cookstown, in the rural village of Donaghmore, you’ll find a crumbling high cross, part of an early Christian monastery founded by St. Patrick during the 5th century. And near the eastern shore of Lough Neagh, in the village of Ardboe, stands the first high cross ever erected in Ireland and the only remaining – fully intact – of its kind. Over the past 40 years, Tyrone has seen more than its fair share of war. In 1998, terrorists belonging to paramilitary group named “The Real IRA” (a splinter group of the Provisional IRA) planted a bomb at the densely populated centre of the county town of Omagh. The incident is generally accepted as the worst of the Troubles, stripping 29 innocent people of their lives and injuring 300 more. It attracted sympathetic but ultimately negative international press, most of which successfully characterized the tension and overflow of the ongoing conflict. The consensus, of course, extends to both sides. The county emblem, the Coat of Arms imprinted with the Red Hand of Ulster, is in spite of its Catholic majority. Unfortunately, tourists travelling to Omagh today rarely stay, despite the town’s noble efforts in overcoming many of the difficulties towards social and economical stability; however, one of the upsides to Tyrone and another one of the things that it is most proud of is its history of emigration, a history that most definitely precedes that of the Troubles. A museum named The Ulster American Folk Park pays tribute to Ireland’s best- known emigrants to America, including prominent 18th and 19th century figures like Davy Crockett, Ulysses. S. Grant and Andrew Jackson and features full-scale replicas of a Famine cottage as well a New York City Tenement. Next door, the Emigration Database houses an extensive library of books on Irish-Americana.